Kaboo Designs: Delicious Doodles #13 - "Pink"
Delicious Doodles #13 - "Pink"
Oh my gracious the day got away from me... I should have posted this first thing this morning, but obviously that didn't happen. It's challenge day over at Delicious Doodles and I really enjoyed this one. The full challenge title is "Pink to make the boys wink". 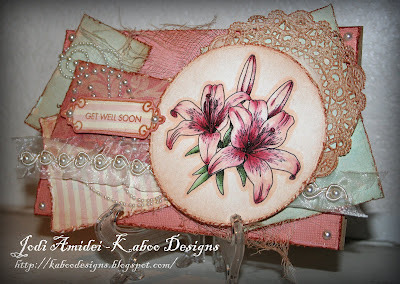 I needed a get well card so I used one of Teri's amazing floral images to create this slightly shabbychic card. Isn't that image just wonderful? Her florals are so terrifc and versatile! I colored it with my Copics, then grabbed my pink and blue scraps - added a touch of distressing to all the edges along with some sepia stippled ink. A simple sentiment, some pearl embellishments and some sweet lacy ribbon was all it needed. Drop by the Delicious Doodles Challenge site to see some other great examples from our design team - then get your creative groove going and join us. There are five digi's up for grabs! WOWZA! What can I say?? GORGEOUS! Thanks so much for joining our "ANYTHING GOES" challenge at Shelly's Images! Please come back and join us again real soon!! Beautiful card, love the layers and your colouring is so pretty. Thanks for joining us at Do You Stack Up, hope to see you next week. A fun scraptacular card. So many great embellishments, distress inking and great coloring. Thanks for playing along with us at DYSU.